CVD Equipment Corporation, Booth #720, cordially invites you to attend the exhibit held in conjunction with the MS-T15 conference this fall in Columbus, Ohio. 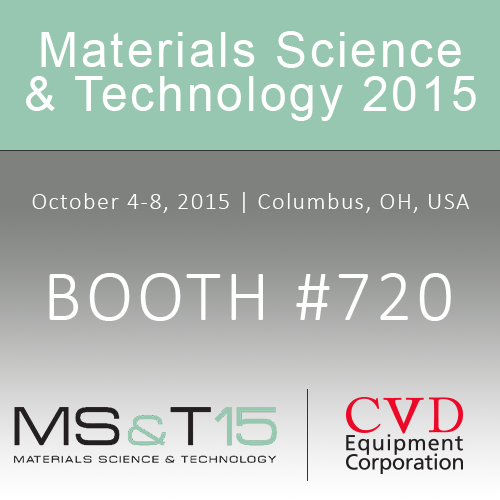 We will exhibit our range of chemical vapor deposition equipment and services. Talk to our application engineers about your deposition requirements and learn about our >32 years of experience in design and manufacturing CVD technologies for coating a range of substrates, including fibers, 3D shaped parts, porous structures, wafers, foils, tapes, complex surfaces, etc.